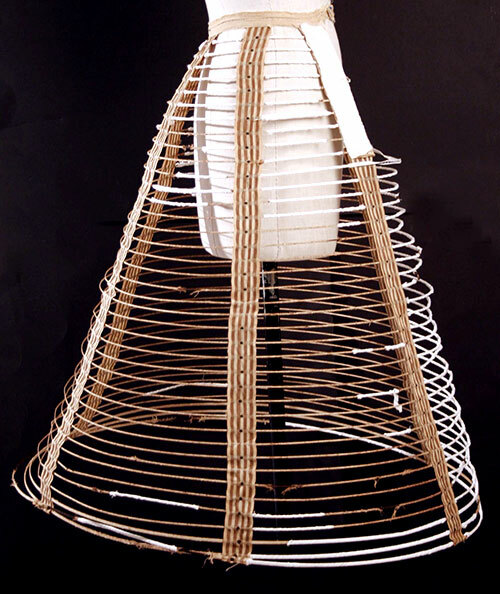 The 1800s crinoline, also called a hoop skirt or extension skirt, was inspired by the open cage or frame style of the 16th and 17th century farthingale and the 18th century pannier. The Victorian crinoline developed various appearances over it's fashion lifetime as a result of new designs and methods of manufacture. The word crinoline originally referred to a stiff fabric with a weft of horse hair and a warp of cotton or linen thread (the Latin crinis meaning hair and linum meaning flax). This fabric made its first appearance in fashion in the 1830s when it was used in women’s petticoats to support and shape the growing length and diameter of the early Victorian dress. Often a petticoat of this stiffened fabric was worn with up to six starched petticoats in an attempt to achieve the big skirt effect; these tangling petticoats were heavy, bulky and generally uncomfortable. The heavy folds of velvet fabric of this Victorian ball gown are supported by a hoop skirt. At its peak in size, the crinoline reached a diameter of up to 180 centimeters, almost six feet. Next rings of stiffened cord encircling the petticoat were tried. These corded skirts were too heavy, thus unable to support their own weight. During the 1850s the extension skirt was developed with rigidity added to the skirt in the form of cane and whalebone hoops. These hoops created the desired width but were too easily broken. Subsequently thin strips of brass replaced the cane but the brass did not possess sufficient elasticity to enable the skirt to resume its rounded form after being submitted to considerable pressure. Ultimately hoops of flattened steel wire were employed to stiffen the “extension skirts” of the late 1850s and were found to be lighter than cane or brass hoops. Furthermore, the flattened steel wire was so elastic and strong that it could be severely bent (going through doorways or sitting), and yet the skirt would spring back to its original shape. 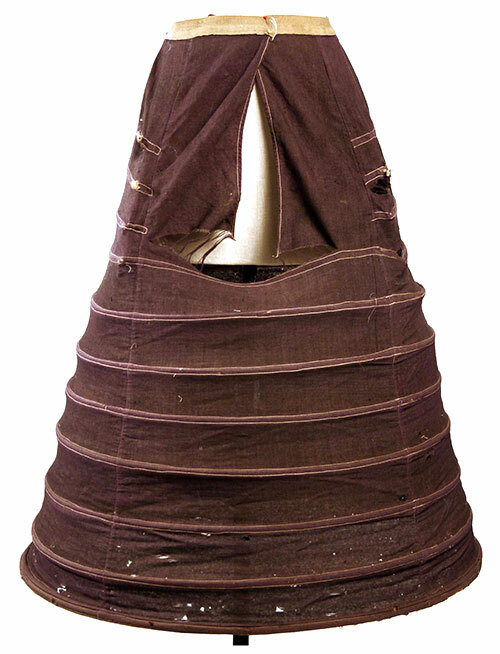 The cage crinoline was adopted with enthusiasm; it was light and only required one or two petticoats worn over the top to prevent the steel bands from appearing as ridges in the skirt. At its peak in size, the crinoline reached a diameter of up to 180 centimeters, almost six feet. The wearing of the crinoline was a fashion that was adopted by all classes, and worn by both women and young girls. The best steel for making the wire for the crinoline cage came from England, in the form of coiled rods, of about ¾ of an inch in thickness. The first operation to which it was submitted, was heating it to about a bright red heat in a furnace adapted for the purpose, by which it was softened. It was next scoured with acid, to remove all oxide from its surface, after which it was coated with rye flour and dried in a special apparatus. Next the steel rod was reduced in diameter, while at the same time greatly extending its length until it became a No. 19 wire in size, and had been extended in length from a few yards to no less than two thousand yards. After having been reduced to the requisite size it was flattened by drawing it from one reel and winding it upon another, then hardened and tempered. Lastly yarn was braided around the wire, and then sent to the warehouse to be placed in skirts. No less than 60,000 yards of flattened steel wire were made and covered daily in this operation. 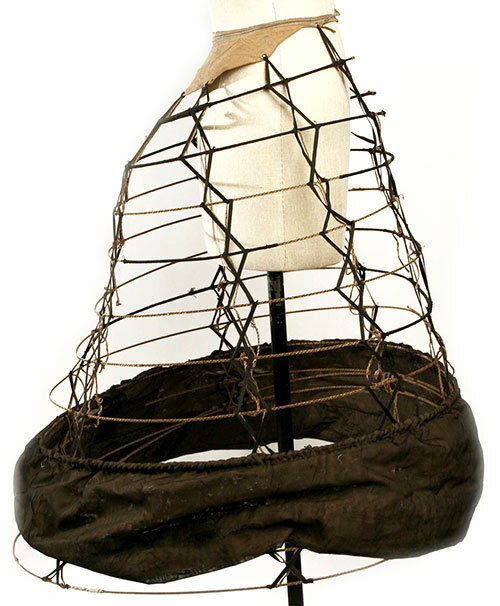 These covered wire hoops were suspended by tapes in the form of a skirt, descending in increasing diameters from a band worn around the woman’s waist. They are made of fine cloth. The Bustle is of fine whalebone, extending part of the way round the skirt; at their ends are eyelets, through which a corset lace is passed. In 1858, Douglas & Sherwood referred to themselves as a “manufactory of hooped skirts” with almost four hundred young women employed in their factory. 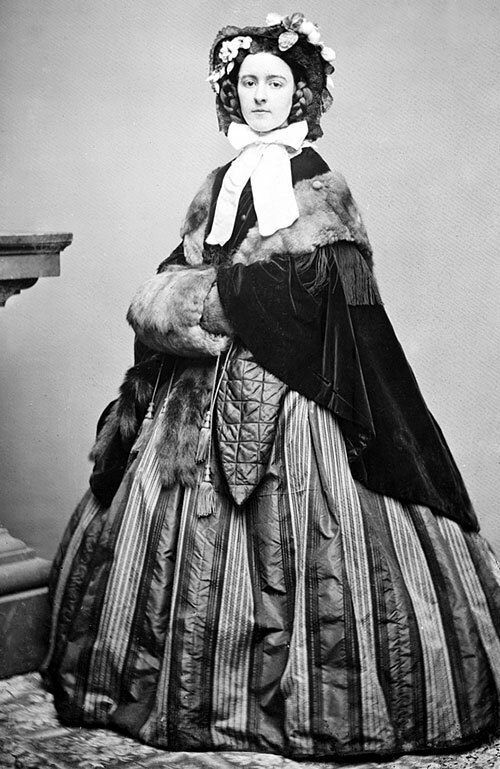 They advertised their new style, the “Adjustable Bustle and Skirt” in the February 1858 issue of Godey’s Lady’s Book and Magazine; the bustle was made with “round whalebone.” Later that year, Douglas & Sherwood introduced their “Balmoral Skirt” which combined both the hoop and a woolen, red and black graduated stripe skirt. The “Highland” costume was featured in Peterson’s Magazine in 1861. With this dress, a Balmoral hoop skirt was indispensable. Some ladies made the petticoat of plain gray flannel, and ornamented it with rows of red cloth or flannel. Douglas & Sherwood, W.S. & C.H. Thomson, J. Wilcox & Co., Wallace & Sons, Arms Brothers, J.P. Moran & Co., C. L. Harding, S. H. Doughty, Chas. A. Postley, R. France, Theodore Schmidt, Ernest L. Schmidt, H. S. Hewson, Chas. P. Colt, John Holmes, J. & W. Beck, H. G. McKenna, Frost & Co., G. M. Jacobs & Co., Jos. B. Wesley, Moritz Cohen, Emanuel Mandel, Stein & Stern, David Henius, Fisher & Herman, Union Skirt Company. 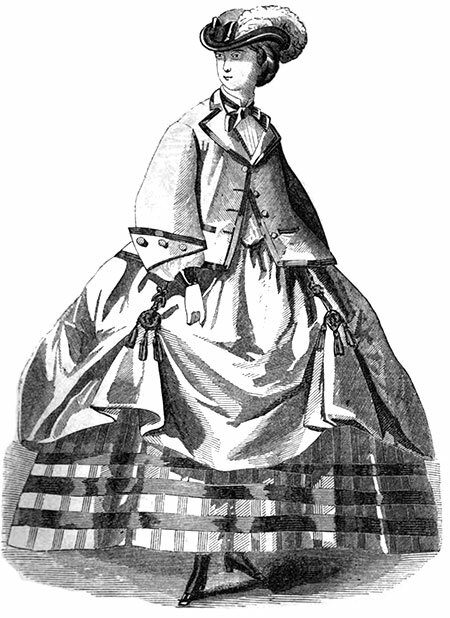 Godey’s Lady’s Book and Magazine in 1859 provided a picture of “The Woven Extension Skirt” saying that it was impossible to rip or tear the tapes “as they were wove in the springs.” Also in 1859, J. Holmes & Co. stated that in spite of its lightness and compactness, an extension skirt’s primary concern was “easy adjustability into smaller space for the parlor or expansion into ample dimension for the promenade.” J. Holmes & Co. introduced their new patent extension skirt with a system of clasps and slides; this skirt had a watch spring bustle wrought into the skirt, forming a uniform bishop shape throwing the fullness at the back, and hanging gracefully straight in the front. The crinoline reached its maximum dimensions by 1860 but then gradually began to change. 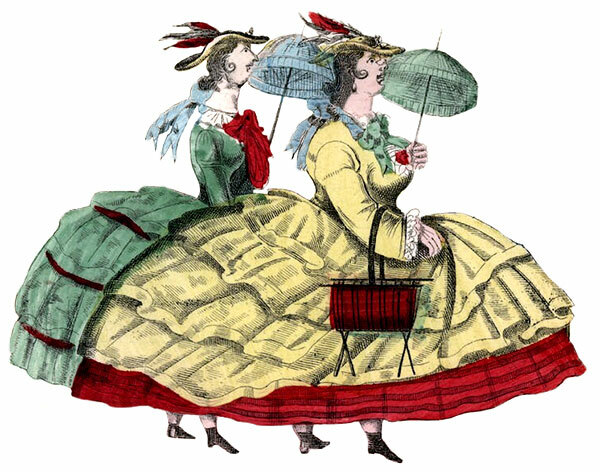 An 1860 ladies’ magazine referred to the crinoline as “bird cagey contrivances” and stated, “The pyramidal crinoline, diminished in size but in demi-train, is in favor.” In 1862, the English Woman's Domestic Magazine recommended the W.S. Thomson crinoline to “those ladies who prefer the open petticoats, or cages.” Over 2,000 workers were employed in Thomson’s London location, producing 4,000 crinoline cages a day. According to the magazine, Thomson’s crinolines possessed two advantages over other manufactured skirts: “the binding on which the steels are threaded cannot break in consequence of it being so broad; and the eyelet-holes do not wear away the tape so quickly as do the metal claws usually used to secure the steels in their places.” Furthermore, the back of the jupon of the Thomson crinoline was threaded in the shape of a gore, to suit the fashionable train skirts. The upper half of the back part of the crinoline was made with a small inside one which passed half way round; but being smaller than the outside, threw the skirt off behind in a demi-train. 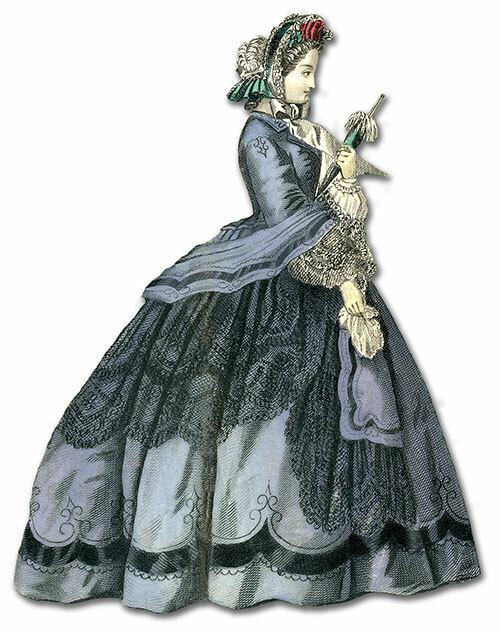 By them middle of the 1860s, the dome-like shape of a women’s skirt decreased with the volume disappearing in the front and gathering at the back. 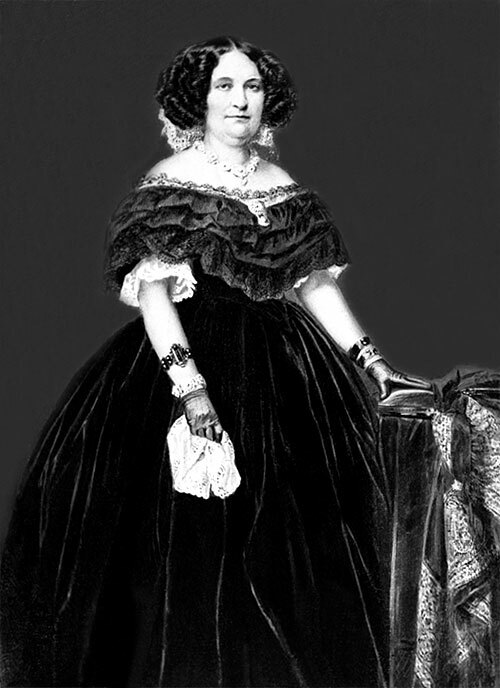 In 1865, A.T. Stewart advertised a “Bon-Ton Skirt,” a wire flexible spring skirt that kept the front of the skirt “fitting closely to the form.” By 1867, Godey’s Lady’s Book and Magazine decided that “ladies enjoyed more advantages respecting dress – close and flowing sleeves, short and long skirts, tight-fitting, case like dresses, others with plaits at the back . . . waists fitting corset-like over the hips, hoops clinging to the figure, and the positive extreme bustles!” The pannier fullness at the back was made to curve gracefully with the front of the skirt perfectly straight, fitting smoothly over the figure. Label reads: Prize Medal Skirt. By Her Majesty's Royal Patent Registered Trade Mark 20 the royal coat of arms and a crown printed on the herringbone woven tape waistband, vertical herringbone woven tapes 1 inch; 2.5 cm wide, fastened to the hoops with brass eyelets, the front two crossing, nineteen cotton covered steel adjustable hoops, height 32 inches; 82 cm; diameter approximately 2 feet; 60 cm. Available for purchase from Meg Andrews at www.meg-andrews.com. 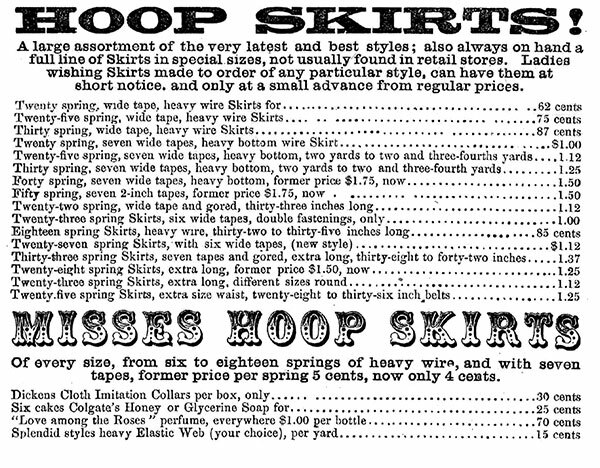 In 1868, a Boston Massachusetts’ store advertised latest styles of “wire skirts.” Prices of the hoop skirts varied according to the number of springs, which ranged from 18 to 50 springs.